Mark Bello perfected the pizza, then built a business teaching pizza-crazed New Yorkers how to do it themselves. 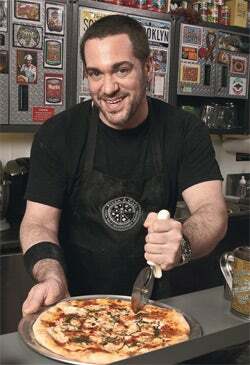 Last year The Village Voice declared Mark Bello's pizza one of the three best in New York City. And it is sensational: a thin, crisp crust paved with the ideal balance of cheese and sauce, finished with fresh basil and a drizzle of top-grade olive oil. But you can't buy it. You have to make it. And this in a city with more than 1,800 pizzerias. Bello is the founder of Pizza a Casa, a "pizza self-sufficiency center" on the Lower East Side where he passes on what he's learned over a lifetime obsessing on the perfect pie. Students spend four hours and $150 learning how to make something they could buy--in cheesier form--for about $2 on most street corners. The classes, offered three days a week, sell out so fast he recommends signing up two months in advance; demand is so strong he has started offering pasta sessions as well. Bello, who is self-taught, had been giving pizza classes around the city and in his own apartment in Chinatown for five years before he decided to literally set up shop, with a kitchen classroom and pizza equipment to sell, from peels to wheels. Student reaction to his personality and his itinerant classes had been so enthusiastic--both word-of-mouth and on online survey sites like Zerve.com--that last April he opened with a waiting list. Pizza a Casa is a niche business, but Bello notes that more and more Americans are willing to pay to learn to cook at home, especially in this economy. And hands-on is a better way to learn than watching television or reading a cookbook. 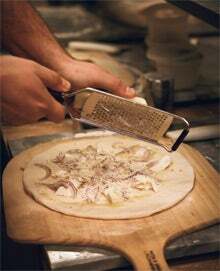 "Simple food is not easy, and aspiring pizza-makers know that," he says. Using his arts background--he has a master's degree in sculpture from the School of the Art Institute of Chicago--Bello designed every inch of the stylish 450-square-foot space. There's a trestle table down the center outfitted with a marble slab for each of as many as 16 students and a tiny station in one corner where he can demonstrate his "deejay-twist" action to stretch dough and have it telecast by "dough cam" onto the overhead screen next to the home-style ovens. Bello opened on a Manhattan shoestring: less than $150,000 from a furniture business he started after grad school and turned over to a partner. He also says he was "not afraid to pick up a power tool" or to barter like crazy. One example: "I wanted to show you can make pizza in any oven," so he presented his business plan to the Viking appliance company and persuaded it to donate equipment. Bello chose the right location, too, on the same block as the famous Kossar's Bialys shop and the Doughnut Plant, which draws tourists even from Japan. Then he let former students and friends in the media spread the word. More than 1,000 students have baked their way through Pizza a Casa, turning out 2,300-plus pizzas. Friends of former students and repeat students who bring friends and family typically make up a majority of the classes. "Most of my students have never touched flour in their lives," the New York City native says. But Bello also has taught restaurateurs, some from as far away as Turkey and Paraguay, who want to "up their pizza game." Bello has a book proposal in the works and says expansion is a possibility, too. But for now, "the class is dependent on me," he says. "I don't want to make it cookie-cutter."